Published: Aug. 13, 2012 at 11:14 a.m. 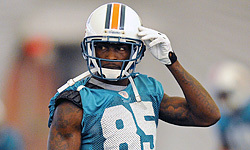 Updated: Aug. 13, 2012 at 06:15 p.m.
Miami Dolphins coach Joe Philbin put on his reading glasses and looked at notes as he explained the decision to cut wide receiver Chad Johnson. Philbin is a guy who always seems natural, but he wanted to make sure he said the right thing here. "With any type of these decisions, it was not an easy one," Philbin said during a Monday news conference. "It was not reactive, nor was it based on one single incident." Johnson was released by the Dolphins on Sunday, as first reported by NFL Network contributor and Fox Sports insider Jay Glazer. Philbin made it it clear that Johnson's Saturday night arrest on a domestic violence charge for allegedly head-butting his wife, Evelyn Lozada, wasn't the only reason why the receiver was cut. "In making these decisions, we base our evaluations on a set of criteria that supports our organizational goals and includes a player's performance both on and off the field," Philbin said. "Essentially, we take into account the overall body of evidence to determine whether an individual is the right fit for this organization, and more specifically, this football team. That's how we made previous decisions, and that's how we plan to do so moving forward." Translation: Johnson was on a short leash in Miami, and he quickly used up all his rope. There's no telling what's next for Johnson now, but it's no longer Philbin's problem.